Be sure to check out a new Charlotte Observer editorial that’s running this morning in the Queen City and here in the Observer’s McClatchy twin, Raleigh’s News & Observer. 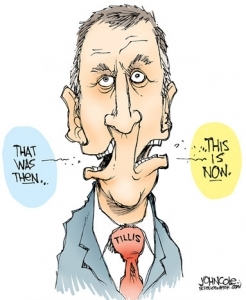 In “Thom Tillis the moderate? Be skeptical,” the authors rightfully call out Tillis for his recent, pre-2020 election posturing and pretenses of moderation. We understand the challenge Tillis faces. If he votes against the president on high-profile issues, he risks losing the support of N.C. voters who are passionately behind Trump no matter what. He has apparently chosen a different strategy: Keep those Trump backers happy, but talk a good centrist game in hopes of grabbing enough moderates to win. Will it work? Perhaps. But Tillis should own who he is, and North Carolinians should recognize what he isn’t.